Out with the old and in with the new. This is the last image you will see of the old “black design”. As you can tell, I’m in the midst of the changeover to the new blog design. It’s going to take a while but I will convert the key posts over time. Here is a fully converted post, so you can see what I’m trying to do. As I mentioned a few days ago, I rethought the design assumptions I originally had when I started this thing over 3 years ago. Back then, I was planning to write a lot less. I wanted a black background to showcase the photographs, but I also wanted a sidebar for easy navigation. That of course limited the size of my photographs. There were some conflicting goals but I lived within the limitations. 1. Make the text as readable as possible I’m writing a lot more content and having a white background is easier on the eyes for most people. I’m also increasing the size of the font. I tested this on an iPad mini, and the larger fonts make it easier to read on smaller tablets. 2. Larger Photographs This is a photoblog after all so I wanted to maximize the photo size. This is one of the things that always bugged me about the old layout. 3. Simplify the Design I’m decluttering as much as possible, increasing whitespace. Removing the side bar and simplifying the header helps. Overall, I’m trying to increase the production value of this site. Have good content, of course, but also make it look better. Perhaps even a bit more magazine like, if I’m ambitious enough. There are always cons to any new design, the biggest one is the reduced navigation by removing the side bar. The Popular and Recent links are now located at the bottom. The font is smaller than I like but I don’t have much control over that. I do plan to put more related links within the posts to make it easier you. I have a lot of work ahead of me, but hopefully it is worth the effort. Every photograph needs to be resized to the new larger format. I also need to enlarge all the fonts on every post. Finally there are miscellaneous tweaks to make in color and styling to fit in better with the white background. I hope you like the new design. Please tell me what you think. And as always, thanks for visiting. Why wouldn’t I like it? It looks like mine … without the sidebar and the big header photo. I tried not having a sidebar, but it made it difficult to find posts (I have 1400!) so I added a left sidebar — less intrusive than one on the right. I really appreciate the white background. Much easier to read text. Very nice. You’ll be playing with it for a while 🙂 But it looks great. No doubt I will continue to make tweaks. We will see how this works out. It will be interesting to see the impact of the white surround on your photos. Generally, large white mats have a tendency to diminish the impact of framed photos unless printed high-contrast on a luster or gloss paper. What you have here is a large (admittedly soft) white mat. It may lessen the impact of your photos — or it may not. Time will tell. Also, I don’t know how it would play on an iPad but you might consider using a two-column format for text, possibly with a very thin vertical rule dividing the columns and a bit of air distancing the type from the column rule. On wide screen monitors (even on my relatively small 20″ screen) sweeping one’s gaze left to right repeatedly on full-width text may induce vertigo. I think the black background has more impact and that’s the reason I originally went with it. But at least the LCD displays are backlit so the images still seem to have some pop. I guess we will see. Overall though I think it is a softer and less distracting design. I’m not sure if I have the skills or customizability to do really fancy things but I’ll see. I now have a wider canvas so I have more options. Let me backtrack on my first comment. Your photos certainly have the strength and dynamics needed to hold their own, even without the black surround. Now that I’ve seen this first set of pictures it’s clear you are right about the backlit images retaining their “pop”. The converted post, the Olympus review with lots of product shots, suffers a bit in comparison to the original. Maybe the use of white no-seam backgrounds or dropped-out surround going to white needs a new approach going forward. Attempting to revise all the earlier posts would be a huge task and not worth the effort. All in all, the revised design looks very good. I considered enlarging the E-P5 product shots but I kinda liked the little product shots interspersed within the review. Though I admit that some of text wrapping could be done better. I don’t have true design and layout skills so making it really polished might be a stretch but I’ll how this evolves. I’m looking at the blogging and the layout as a creative endeavor like photography. Andy, I think it looks great! Do you really have to go back and reformat the existing posts, or can you just use this new format going forward from here? Nice job. I don’t have to reformat the old posts but the text wrapping and the small photos, at times, look goofy. I would like to make the photos bigger since that would better showcase them. We’ll see. I already spend an inordinate amount of time on the photography / blogging thing. I like this new look. Better than the previous if only for the larger photos. I also like the simplicity of the overall look. A single column works well here. First, may I suggest you can always put a black frame around any photo. You cannot use two different formats, a dual column for text and single for photos. Unfortunately, you may have the option of using one or the other, but you have to pick one. How nice if you could format by individual post or sections of a post — but not yet. Maybe eventually. I don’t think the white background is problematic. Once I got over my passion for black mattes, I began to like the way my photos look. On a computer, it IS different. Photos show very differently online than hanging on a wall. AND if anyone clicks on a photos — which a lot of people including me do as a matter of course — up they come with a black background. I’ve seen some people add a black frame. It can look nice. For various reasons, I’m not going to do that but thanks for the suggestion. I have grown to accept white, it has its own advantages. Overall, to me, white looks more minimal than black. Of course white has the main benefit of clearer text. I think there are ways to have two columns within a posting but that involves fancy html and css (the template does not do it automatically). I may play with it someday but it is not a priority. My setup is different and custom. I actually don’t upload any photos on to WordPress. All of my photos are linked off my Smugmug account which holds my library. When you click on my photos, it brings up a larger version in Smugmug, which now has a white background. I have the added (theoretical) benefit of people being able to purchase image from Smugmug. I say theoretical since I sell very few images. I have the white up now. As you know with this (your)template you can switch back & forth from light to dark…which I’ve done multiple times over the years. I think the white on your site looks much cleaner and more professional. As someone said above, when you click on the images a dark background displays…at least that how it works on my site which is the same template as yours. I think you get the best of both worlds that way. I thing the chances you made look great. Jim, thanks. I really like your photos and yes, I finally switched to white which I like so far. I appreciate your suggestions. I went to black text on white background sometime back on my blog. White text on black used to not bother me. As my eyes age and since I started wearing glasses pretty much full time the white on black started to really get to me. The words started blurring even with glasses and I couldn’t stand looking at my own blog! I do still like having a black background for my portfolio site – for now. FWIW, most of the text on your blog isn’t showing up in Chrome, at least not on my work PC. I had to use Firefox to be able to view the site. I do like the more minimalist look. I have to admit your blog was getting a little too busy and intense looking for my tastes and I really didn’t care for the ads at the bottom of the posts. The more discrete “Support Me” at the bottom is favorable. I don’t know what that does to affiliate link effectiveness but for me personally the less in my face a site is with ads the more likely I am to visit, stay a while, and maybe show support. One pop-up ad and I’m gone forever, I don’t care how much I liked the content of the site. Mike, yeah, I’m getting old too and the white is easier on the eyes. I fired up Windows and tested on Chrome and IE and I’m seeing the text so it may be some weird system specific issue. For the record, the ads at the bottom are placed by WordPress.com and not by me. It is the price that I (and we) pay for me using a free hosting site. I’ve considered paying extra to get rid of the ads, maybe someday. Laurent, never heard of feedly until you mentioned. I just tested. It seems to work great. The photos are not large like my site but all the content looks well formed and easy to read. While reading black text on a white background is easier for most, it is only slightly easier for me but viewing photos surrounded by white is much more difficult for me to see than on a black or gray surround. Before if I wanted to see your blog image in a larger size I just clicked on the image and was redirected to your other site where a larger image could be viewed. Hi Tom, the feature to see a bigger version is still there, but it does open to a white background. 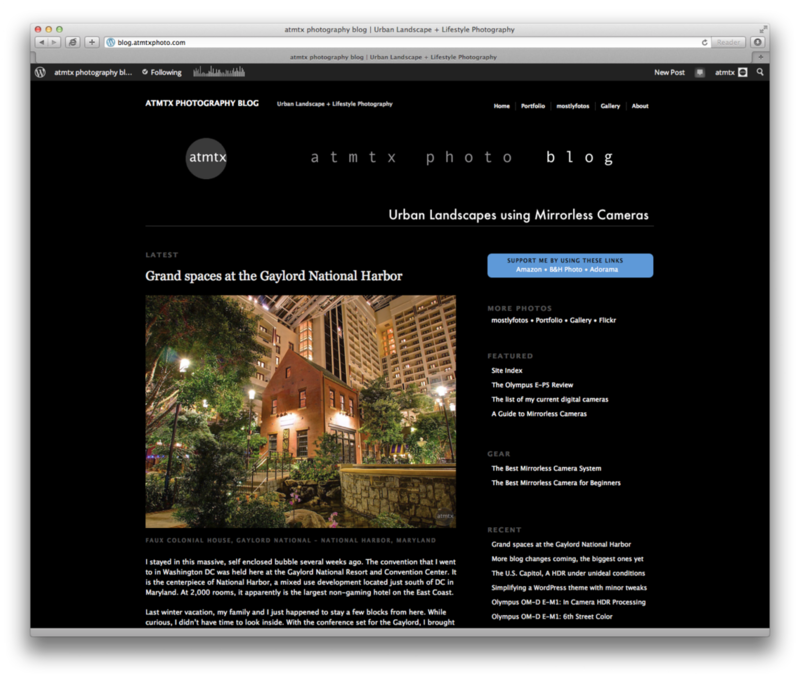 The difference between my picture size on the blog and the larger one on Smugmug is not as pronounced now. Also, the click for a bigger size feature depends on the size of the browser window. The picture preview automatically scales the image to the size of the window. What I do now when reading your blog is to narrow my browser until there is only about a quarter inch of white showing at the edge of the photos. Then the darker color of my desktop makes it easier for me to view the photos.